The increasing political correctness of this time of year makes it far more difficult than it used to be to wish people a Merry Christmas. On the other hand, being aware of other cultures and traditions is a good thing, and taking a second to stop and think that not everybody is like me and does what I do — that’s a good thing too. Expanding one’s horizons is always a plus, even if it’s less comfortable than a narrow worldview. Anyway, so — whatever it is you may celebrate, be it Yule (which is just past), Christmas, Kwanzaa, Hanukkah or just good old consumerism, do it happily! That’s an order! 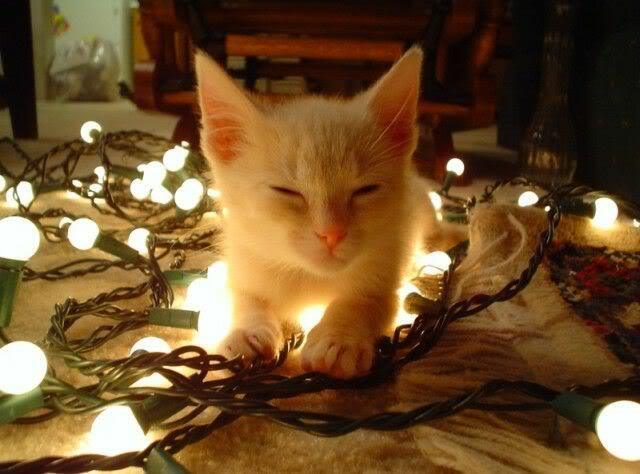 Here, have a Holiday Kitten. How can you resist? Coming to the States from elsewhere, I’m always amazed by what a contrasting and occasionally downright weird country this is. On the one hand you have people campaigning because it should be CHRISTmas and everyone else should be burned at the stake, especially if they have the temerity to wish you “Happy Holidays” instead of a “Merry Christmas” — and on the other, you have the very fact that there is a debate. This place isn’t made up just of white anglo-saxon protestants, and many different cultures, religions and traditions have some kind of year-end, deep winter celebration. Acknowledging this diversity, even if it means we then have to wriggle in paroxysms of confusion about what the correct good wishes might be, is A Good Thing. Peace on earth and goodwill to all. (Yeah, it should be “men” but I’m a WOman so I’m going to put my foot down here.) Cute Kitten demands it. 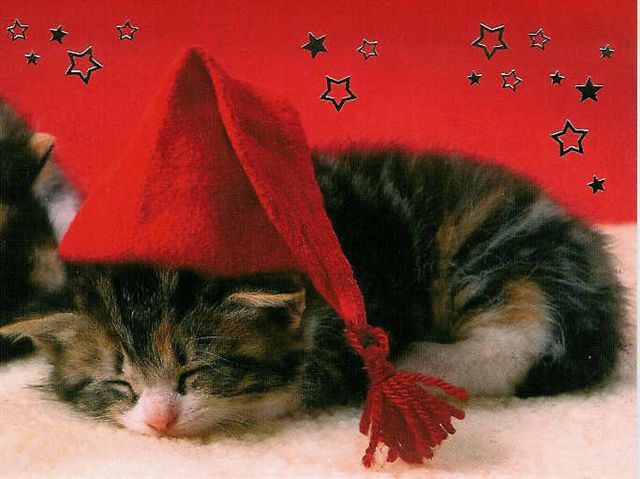 EDIT — Since the evil Scroogegrace ran off with Holiday Kitten, have Holiday Kitten 2 – The Replacement. That’s it, I’m sending in the flying monkeys. 2nd kitty kinda reminds me of my own, Snoopy, without the markings. How they grow so quickly! Merry Culturally Appropriate Winter Solstice Festival to you all! Mandatory Happy Seasonal Funtime to you, citizen! Those are awesome pictures! Happy Holidays Ysh. OMG I just woke up and realized I missed most of xmas because I decided to spend it with my old friend Bombay Sapphire. And now my head is splitting.